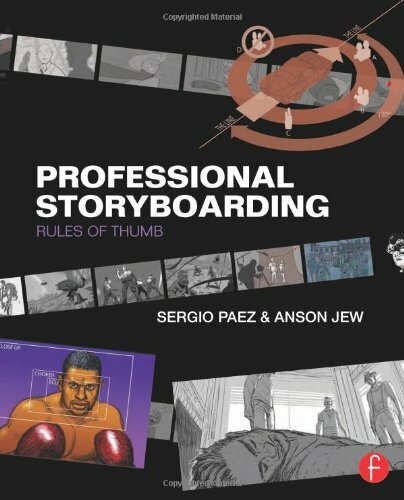 This is an excellent book on storyboarding authored by Sergio Paez, who's the founder of Storyboardart.org. There's a lot of text to read, 260 pages, but it's so interesting I finished reading in one sitting. It's filled with insightful tips and storyboarding techniques. This guy knows his stuff, really well. To get the best out of the book, you must already know how to draw. This book is about applying your drawing knowledge to storyboarding, basically storytelling for film, animation and other video formats. You'll learn things like choosing between wide and close up shots, where to put your camera, staging, storytelling, how to draw fast, simplify, and more. Just to sidetrack a bit, the tips are so useful you can actually use them for shooting your own videos as well. The fundamentals are same, just that some people prefer to storyboard, but you can also apply the knowledge to shooting videos with your digital camera. But of course, this book will help you understand why people storyboard. The techniques are taught very clearly, covering the how and the why. As such, it's easier to understand and remember what's taught. There's also a section on finding jobs, and creating your own portfolio. It's quite illuminating to learn about the movie industry when it comes to finding jobs, as there are things like unions involved. As for creating portfolios, Sergio Paez also goes into detail and also includes things like presenting yourself well online -- clean up your facebook pages -- first impression counts. The last chapter features lengthy and in depth interviews from other storyboard artists, namely Benton Jew, Jeff Zugale, Josh Sheppard and Sherm Cohen.